The junior forward from Braintree, Massachusetts led all Division I players in the nation in total points, goal scoring and points per game. Due to his relentless compete level, it wasn’t unusual for Gaudette to log almost 30 minutes of icetime each game. He was honored by the Hockey East conference as their Player of the Year, First Team all-conference and Hockey East Scoring Champion. On two occasions (January and February), he was named national player of the month by the College Hockey Coaches Association. Best known as a complete, 200 foot two-way player, Gaudette proved to be tough to defend with his deceptive speed and his passion to compete at both ends of the ice. 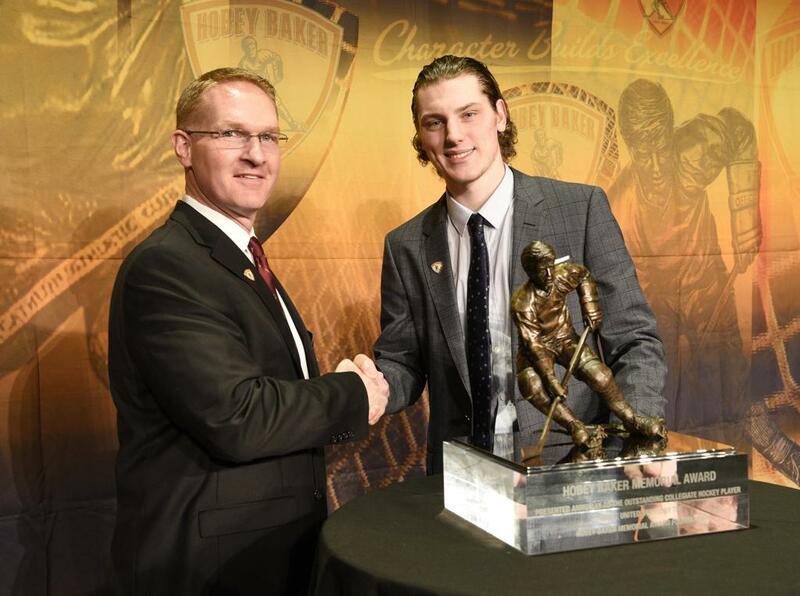 He had plenty of local support having grown up in the Boston area and was enthusiastically cheered along by his large extended family who became known around Matthews Arena as “the Gaud Squad.” Recently, Gaudette was named the 2018 winner of the Walter Brown Award given annually to the top American born player in New England. Adam Gaudette becomes the first Hobey Baker Award recipient from Northeastern University. He has surpassed 50 points in two straight years and in 116 career games, has totaled 142 points. Adam recently signed a pro contract with the team that drafted him, the Vancouver Canucks (2015, fifth round) and will forgo his senior season. As a linemate of fellow Hobey candidate Adam Gaudette, Northeastern possessed the top one-two offensive punch in the nation, terrorizing goalies everywhere. Presently third in the nation in scoring, Sikura is known as a creative playmaker but tops the nation in power play goals with 13. He finished second in conference scoring to Gaudette and was named First Team all-conference.